In the past two weeks I've seen three movies. Small perk of being "between opportunities" or "impacted. "* My severance package doesn't include movie tickets, but it does enable me to take long lunch breaks every once in a while. Since this is the 75th anniversary of Casablanca it's showing on the big screen, and there's no way I'm missing an opportunity for that. I think even Christopher Walken is creeped out by Mr. McAvoy here. Of the two new releases I saw: the first was a fairly mediocre movie but the final 30 seconds made me overwhelmingly glad I'd seen it and eager to see a follow-up. The second was a brilliant, magical story, beautifully done, and the final 30 seconds almost completely ruined my enjoyment of the previous two hours. The first movie was M. Night Shyamalan's latest effort, "Split." I won't name the second movie because I don't want to dissuade anyone from seeing it; you may find the ending enjoyable. Incidentally, I didn't say the ending was BAD. I said it ruined my experience. Considering that I'd been enraptured by the movie until that last bit, that's a bad thing. 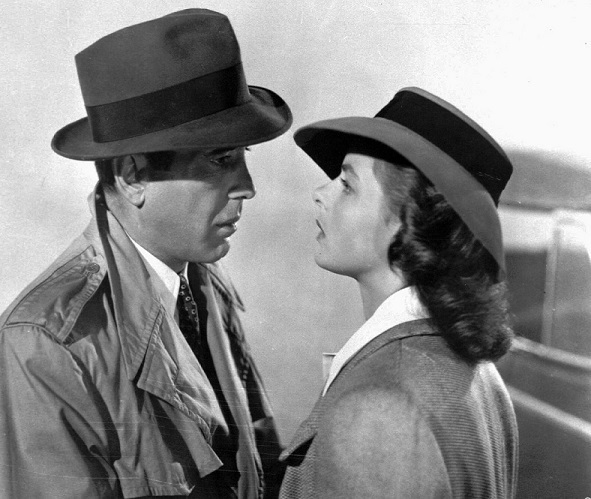 There are dozens of things that make Casablanca the Best Movie Ever Made. Give me a call if you want to spend three or four hours discussing them all. Here's the relevant one for today's blog: the ending was almost impossible to write, yet came out brilliant. Here's the gist: Rick and Ilsa meet in Paris shortly before the German occupation begins. Ilsa believes her husband, Victor, was killed by the Nazis. She and Rick have a whirlwind romance. When the Germans roll into town they need to flee -- but Ilsa finds out at the same time that Victor is still alive, so she leaves Rick hanging at the train station. Rick sets up shop in Casablanca and tries to forget about Ilsa. A year later, she and Victor show up, still on the run from the Germans. Ilsa was unaware Rick had moved to Casablanca. Other important details: Rick still loves Ilsa. Ilsa loves both men. Victor can only be safe if he can get to America, and Rick is the only person who can get Victor out of Casablanca. Turns out Rick can choose how the story ends. He and Ilsa can flee together, leaving Victor to a death sentence, or he can send Ilsa and Victor away together. The studio dilemma was pretty straightforward. In 1942 there was no way a censor board would allow Rick and Ilsa to stay together without Victor dying. (In fact, they had convulsions over Rick and Ilsa having their Paris affair; it was only allowed because she thought Victor dead.) Leaving Victor to the mercy of the Nazis certainly wasn't an acceptable thing for our hero to do in '42, either. The writers had to figure out an ending that would leave audiences happy despite Bogie being left with a (second) broken heart. And they managed to do it perfectly. How do you measure "perfect?" Start with this: no remakes in 75 years. Even fantastic movies like From Here To Eternity have suffered from the remake plague. Not Casablanca. Studios consider it "untouchable," as Madonna found out when she tried to remake it with (wait for it) Ashton Kutcher as Rick. Yeah. Ashton Kutcher. Sorry, kid. You'll never have Paris. **I realized I could name an awful lot of movies with "Impact" in the title. Deep Impact. Double Impact (with Jean-Claude van Damme!). Sudden Impact. Deadly Impact. Final Impact. That last one had Lorenzo Lamas. Do you remember Lorenzo being in Grease? I sure don't.